Re: scc 3rd Edition Builds: Giant Monsters......Giganto! Hmm I have some ideas. Not sure if it will be 1000 pts but who knows. And a picture of said monsters might be hard to find. Definitely will get back to you on this. Power Loss: It's cold aura nullify does not work on magical flames. Darkvision is limited to 60 feet. It's impervious toughness does not work against Epic weapons. It's Glacier Bond senses is limited to 10 miles. Prejudice: The Shivhad is a hideous monster. Weakness: It takes 1.5X damage from fire. This is a D&D 3.5 Shivhad from the Frostburn guide. Offensively it is PL 10.5 using it's Bite. Defensively it is PL 11 due to it's Spell Resistance. Shivhads are thankfully pretty rare. It spends most of it's time underneath it's chosen glacier. They subjucate the tribes in the local area using fear and power and will leave them alone as long as they sacrifice one intelligent creature per week. The creature enjoys stalking and tormenting it's prey. This is pretty much a direct conversion. Some things like it's Absord Cold ability I just had to give a rank since it regenerates 5 points per spell level. It's crush ability was a little tricky to figure out. It pins a target if they fail a dodge check and once the target is pinned it takes crushing damage. And it will continue as long as the monster keeps crushing it's target, thus it has the concentration extra. It has a lot of abilities protecting it defensively like it's damage resistance, immunity, glacier bond, spell resistance, and it can regenerate using absorb cold or ability drain power. Re: scc 3rd Edition Builds: Giant Monsters......D&D Shivhad! a mass of lashing tentacles surrounding two fearsome claws. Power Loss: Magic weapons and silver bypass the Scyllan's damage reduction. Darkvision does not work beyond 60 feet. Those who resist the frightful noise are immune for 24 hours. Frightful Noise does not work beyond 100 feet. It's interior toughness is 7 and failing a toughness save by two degrees puts a hole in it for which a character can escape. Weakness: Scyllans cannot breathe on land and will start to suffocate unless they hold their breath. This is a D&D 3.5 Scyllan from Stormrack: Mastering the Perils of Wind and Wave. Offensively it is PL 10 due to it's ability to swallow opponents whole. Defensively it is PL 9 due to it's Spell Resistance. Scyllans are descendants of Scylla a horrible sea monster with six snaky heads. Scyllans hide in dangerous passageways for ships sapping crewmembers will with it's Frightful Noise and attacking them with it's many tentacles. This is pretty much a direct conversion. Figuring out it's Control Water ability was a little tricky. With this power especially in deep water it can create whirlpools. I gave it the leaping power instead of a high athletics score limited to leaping. It can continue to use Frightful Noise as a free action affecting all targets within 100 feet. The most annoying power to figure out and it's most dangerous ability is if it can grapple an opponent then swallow it whole. Defensively it isn't too tough but has Damage Reduction and Spell Resistance. A dangerous opponent especially for those not adapted for water. Re: scc 3rd Edition Builds: Giant Monsters......D&D Scyllan! Power Loss: Lawful or magical weapons bypass it's Damage Reduction. Darkvision does not work beyond 60 feet. Weakness: Create Undead powers and spells do damage to a Necronaut bypassing it's damage reduction. " This is a D&D 3.5 Necronaut from Monster Manual III. Offensively it is PL 13 using it's Trample ability. Defensively it is PL 9 due to Parry and Toughness. A Necronaut is created by demons from the Abyss and sent to the Material Plane to kill and grow by adding bones and corpses to it's body. The Necronaut uses it's Trample ability to crush as many foes as possible and attacks survivors with it's Slam attack. This is pretty much a direct conversion from Monster Manual 3. It is more deadly offensively than defensively. It's Assimilate Corpse power works as follows: Small Corpse Regeneration 1, Medium Regeneration 3, Large Regeneration 5, Huge Regeneration 7, Gargantuan Regeneration 8, Colossal Regeneration 10. Though judges can determine the limitation anyway they want. It's weakness is that a summon undead power can beused to damage it equal to the summon powers rank. Defensively it has Damage Reduction, Spell Resistance and it's Undead traits give it a lot of immunities. It's Trample ability allows it to attack as many foes as it wants in a 60 foot shapable area. Could be used as deadly minions for a Necromancer. Couple of pictures from Dragoncon, though I took a lot and had a ton of people take pictures with me and my nephew who was Bane from DKR. First pic is me as Scarecrow from Batman Begins with Poison Ivy and the second pic is me without a costume taking a picture with Kelly Hu from X-men 3. Not sure if anyone from the forum was there but who knows maybe we ran into each other. Power Loss: Epic Weapons bypass the Mother Worm's damage reduction. Darkvision does not work beyond 120 ft. It's Acid Ray does not work beyond 300 feet. This is the Mother Worm from Dungeon #133 for D&D 3.5. Offensively it is PL 14 using it's Acid Ray. Defensively it is PL 16 due to it's Will and Fortitude versus damaging effects. The Mother Worm is a legendary monster and is thought to be the progenitor of the entire Carrion Crawler species. The creature sleeps for long periods of time only to wake to eat a disgusting fungus that grows in it's lair or to lay eggs. It will also wake when intruders come into it's lair. This is pretty much a direct conversion from Dungeon magazine. Without it's enhanced fortitude and will versus damaging effects it would only be PL 14. It's most deadly attack is it's Acid Ray. Defensively it has high damage reduction, especially versus acid which would require 13 damage to bypass it. It has has some immunities and spell resistance. It's size was hard to guage but according to D&D it is 64 feet or more. My rank makes it around 90 feet. A ginormous Carrion Crawler is always fun to throw at your players. Love it How are you converting PL , disproportionate saves, and handling massive combat bonuses in your conversions? I have my notes on the first page of this thread. It is definitely not perfect by any means. Some monsters actually come close to having the same PL as CR using my method like the Necronaut while some like the Shivad which is PL 11 but CR 20 in D&D. Yes she is. I think she is even better looking in person. I got a pic with Eliza Dushku too who also is HHHHOOOOTTTT!!!! scc wrote: Yes she is. I think she is even better looking in person. I got a pic with Eliza Dushku too who also is HHHHOOOOTTTT!!!! She's one of my geek chic chick faves, too. Power Loss: Darkvision does not work beyond 60 ft. It's interior toughness is 7 and failing a toughness save by two degrees puts a hole in it for which a character can escape. Weakness: A sudden exposure to light blinds the Kuo-Toa Leviathan for one round. This is a D&D 3.5 Kuo-Toa Leviathan from Forgotten Realms Underdark. Offensively it is PL 9 using bite. Defensively it is PL 8.5 due to Toughness and Parry. Blibdoolpoolp creates the leviathans from extremely gifted Kuo-Toa whips or monitors. Kuo-Toas venerate leviathans and hope to attain such high regard in the Sea Mother's eyes. This is pretty much a direct conversion of a Kuo-Toa Leviathan. The creatures most dangerous attack is it's bite and by using free grab can swallow an opponent whole the following round causing a lot of damage. They like to stay in deep water where they would have an advantage over most opponents. Though the creature doesn't have damage resistance it has impervious toughness versus electricity and various immunities to protect it. Unlike most giant monsters it has some advantages like evasion and uncanny dodge to protect it as well. The monster usually doesn't work alone and has regular Kuo-Toas, monitors and whips to swarm opponents which leaves the Kuo-Toa Leviathan to pick off intruders one by one. Loyal: To Ghartok, the Carrion King. Power Loss: Darkvision does not work beyond 60 feet. Quirk: Recognizes Gnolls as allies and won't attack them, but considers all other creatures as food. Quirk: Thkot Tal will fight to the death. This is Thkot Tal an immense Stegocentipede from Pathfinder's Adventure Path: The House of the Beast. Offensively it is PL 8.5 due to it's Bite. Defensively it is PL 5.5. The name was given by the Gnolls which means the Little God. It feeds on the many sacrifices the Gnolls provide it. When Ghartok and his forces first entered the House of the Beast they slew many vermin. Then they came upon an immense stegocentipede which slew many of Ghartok's followers. He stood amazed by the sight. Soon he was the only one left and he knelt down before the beast and heard a voice in his head. The monster was one of the many chosen of Rovagug which gave the stegocentipede an unearthly intelligience. Thkot Tal told Ghartok it has been waiting for someone worthy to waken the House of the Beast and stung Ghartok in the head killing him. But he was born anew with and more powerful body and gifted with the unholy intellect that Thkot Tal possessed. The creature became mindless but loyal to Ghartok the Carrion King. The creature is an advanced stegocentipede that first appeared in the Tome of Horrors Revised. Offensively it has a deadly bite and stinger which are both linked to a poison weaken agility effect. The poison has a secondary effect which can leave a target immobile and defenseless if they become debilitated. Defensively it isn't too tough though it's spines can hurt anyone attacking it up close even if they miss. However they can make a Dodge check to avoid the spines. A fun classic Gary Gygax monster. Re: scc 3rd Edition Builds: Giant Monsters...Stegocentipede! Temper: The Chtylok is a rampaging monster when it is awakened and will not run away from a fight. This is Chtylok a monster who has fought the Hulk and is the supposed protecto of the Fall People. Offensively it is PL 11.5 using it's hooves. Defensively it is PL 12 due to Parry and Toughness. The Fall People's ancestors, a tribe in the Savage Land, when they were looking for new land came upon the Chtylok and were attacked. The tribe retreated and fell back into the jungle. They took it as a sign from the gods not to leave their land and started to leave the creature offerings. They believed that one day a great disaster would happen and that the great Chtylok would save them. In the present day the damage to the ozone layer started to melt the glaciers. The creature was hibernating below and the trickling water awakened it. The creature was at the bottom of Monster Isle and it attacked the monsters there though many fled and came into contact with the Hulk who made his home at the Florida Keys. The Hulk came to Monster Isle to investigate and came into contact with Chtylok and they fought for several days. Eventually they burst through the ground where another battle was happening between the heavily armed Roxxon security soldiers and Stegron Spider-Man, Kazar and Sheena. Spider-Man found out that the Roxxon Oil Company was using microwaves to accelerate the melting of the ice caps. This also freed Stegron from the ice. Hulk finally got the upper hand on Chtylok and Spider-Man tells Stegron about a game called pile up and has a bunch of Tyranosaurus Rex it's controlling pile onto Chtylok. Dr. Gerald Roth the head of the Roxxon drilling operations activated a bunch of bombs in the S.H.I.E.L.D. dams to kill all those in the Savage Land since Roxxon's plans were discovered and he was left as the scapegoat. However the huge hole created by the Hulk and Chtylok stopped the disaster as the water got sucked down the hole. Dr. Roth escaped into the jungle and ran into an angry Chtylok. 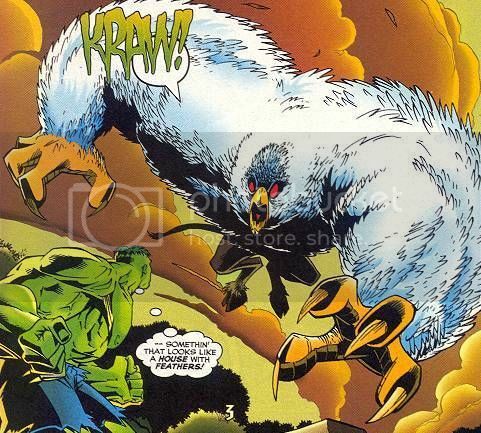 Any creature that can fight the Hulk for several days has to be pretty tough. I did not give it any regeneration but I could see it having some. But with a high toughness save along with the advantages withstand damage and Ultimate Toughness should make it hard to take down. However Hulk was also smart at that time and wasn't that angry fighting the monster. I gave it some powers not mentioned like it's Bird Senses. I gave it some pretty high intimidation since it scared off a lot of monsters with it's shriek "Kraw!' A strange but fun monster.